A Greater Bamboo Lemur (Prolemur simus) feeding on Giant Bamboo in Ranomafana National Park, Madagascar. Photo from Wikipedia. Good news for Madagascar and lemur conservationists! Scientists have spotted bamboo lemurs in 11 sites east of the island where its populations were thought to have disappeared, AFP has reported. The Greater Bamboo Lemur (Prolemur simus) is one of the most endangered primates in the world. Endemic to Madagascar, its name suggest that their primary food source is bamboo. Their specialized diet limits its range. This finding opens “a new chapter for the species and for the places we can protect it by preserving the forest as the main problem is loss of habitat,” Mahaoly Ravaloharimanitra, a research assistant at the Aspinall Foundation, told AFP. The Greater Bamboo Lemur was thought to be extinct until 1980s. Currently there are no more than 300 individuals left. They use to range from western, northern and central Madagascar but are now limited to patches of forest in the southeastern part of Madagascar. Destruction of rain forest habitat by slash and burn agriculture and extensive cutting of bamboo, the lemur’s primary food source. 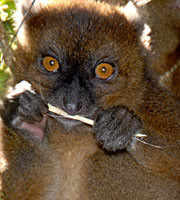 Read more about Greater Bamboo Lemurs on Animal Info.